As a Father to 3 monkies, it is inevitable that toys and other baby-related stuff start cluttering up my house ever so slowly. When Ash was born, we had to buy almost everything brand new simply because my wife and I were not seasoned parents yet and didn’t exactly know what kind of baby stuff to really get. So more often than not, we would rather err on the side of caution and buy everything that we think might be beneficial to our precious firstborn. Besides wasting money, our house mirrored that of a mini toy store where toys filled every nook and cranny. And don’t even get me started on my wardrobes which are bursting at the seams. So what do I have to do? One way is to recoup some of my cash outlay by selling those baby items that my kids have long outgrown. But sometimes, it gets a bit difficult to find a buyer for things which you want to sell. That is where online classified websites come in because these websites allow different buyers and sellers to communicate directly. And SGBabyMall.com is one such online classified website which fulfils the purpose that I am looking for. 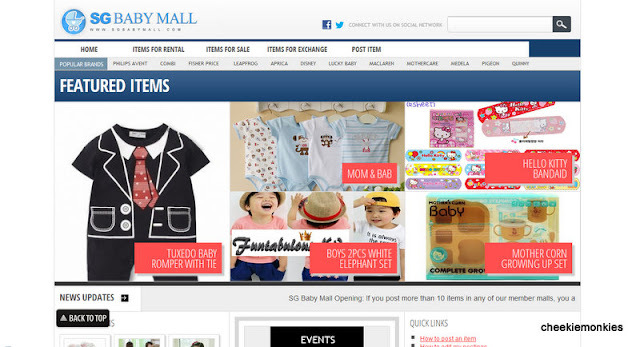 SGBabyMall.com aims to give users a convenient and price competitive shopping experience for anything related to babies and mothers. The process is simple enough – sign up for an account and start posting the item/s you intend to sell! Or if you are in a shopping mood, view the widest variety of baby stuffs and mother related items posted by all its members, and proceed to make an offer to buy should anything catch your fancy. The fuss-free and no-frills layout of the website makes it a breeze to search through the items for sale, as well as to sort them according to either Price or Date Added. But that is not all. You can also rent items which you wish to test out before buying or which you are only going to use for a short period of time. Or better yet, exchange your unused items with other members who have items you need! 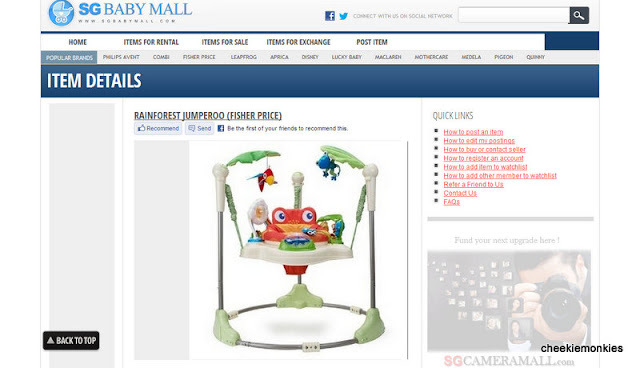 I spotted a Fisher Price Rainforest Jumperoo which is going for a rental rate of S$10 per week. Considering that a brand new one costs more than S$200, it might be more prudent to rent it on a short term basis. 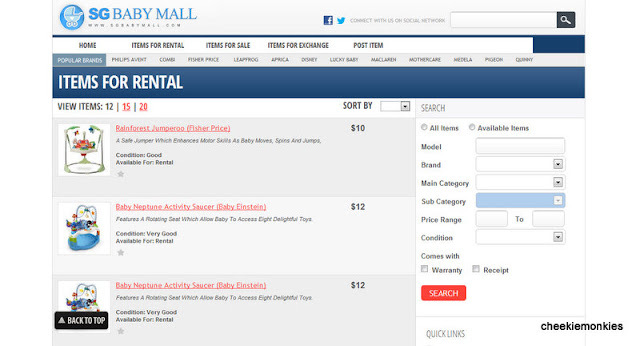 SGBabyMall.com gives you a range of categories where you can buy, sell, rent or exchange products of your choice. 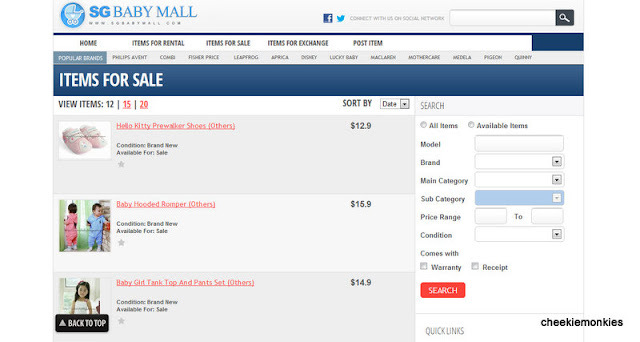 There is even a header tab which showcases the more popular brands for quick and easy navigation! For more information, please visit http://www.sgbabymall.com or their FAQ page. 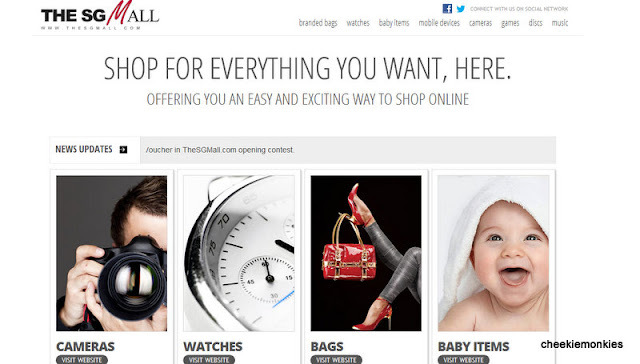 SGBabyMall.com is a member site of TheSGMall.com group. 6. 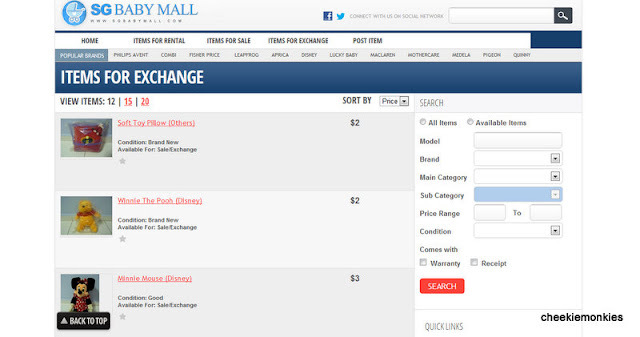 SG Mobile Mall (www.SGMobileMall.com) - Handphone, Tablets and accessories Classifieds.